Among the hottest places on Earth — from Death Valley to Sudan — the destination with the hottest regular temperatures is a remote spot in the Ethiopian desert that’s only accessible by camel. 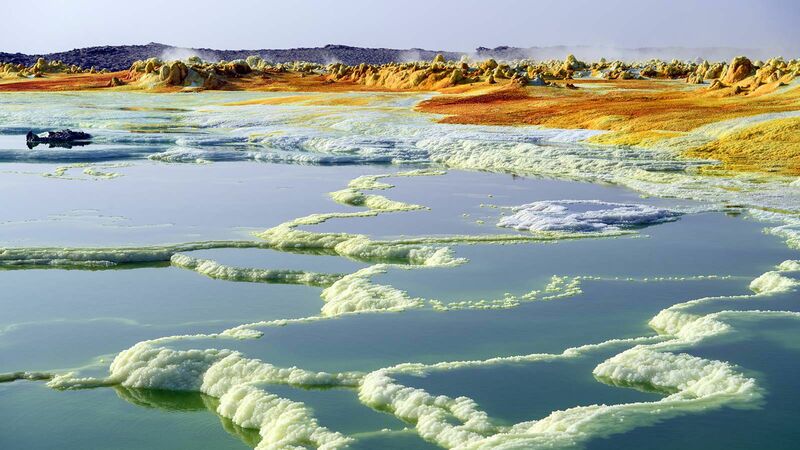 Dallol, in the Danakil Depression, has earthquakes, volcanoes, geysers and salt canyons. 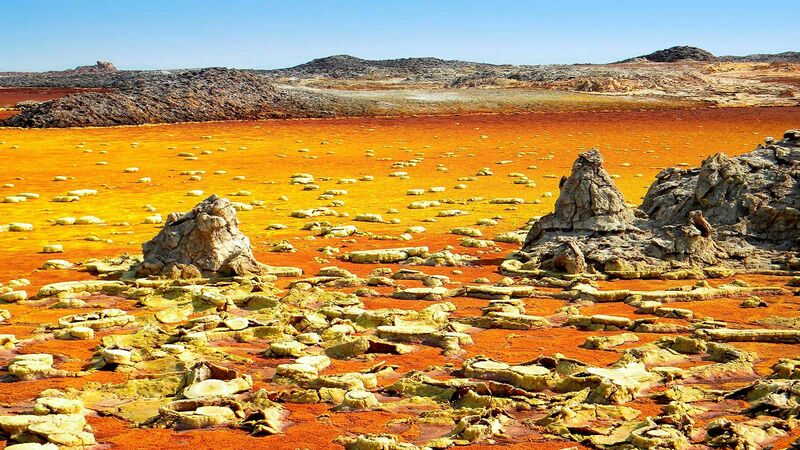 Dallol was at one time a busy camp with workers mining for potash, sylvite, and salt, but the mine is now abandoned. 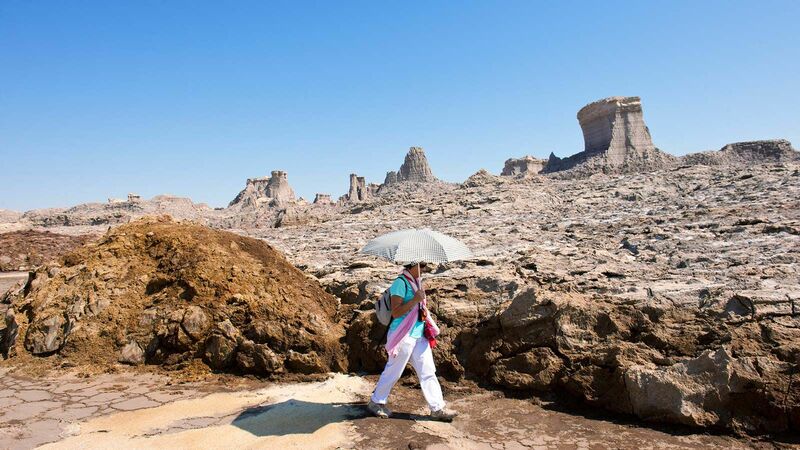 In the 1960s, U.S. mining companies conducting geological surveys recorded a daily high of 115 degrees Fahrenheit, the highest average temperature of any inhabited place on the planet. The only time the average daily temperatures dip below 100 degrees Fahrenheit is in January and February. Even though the area is brutally hot, it’s also strikingly beautiful. The hot springs boast bright colors made by chloride and iron hydroxide emissions collecting in pools. The salt canyons are also some of the most impressive features of the area. Pillars of salt – a result from erosion – rise up to 130 feet high and vary in pinkish hues. People still make the long and arduous trek to Dallol for salt, since it’s one of the few natural resources of value in the region. But because the journey is so difficult, the locals refer to the area as “The Gateway to Hell.” There are no roads; traveling by camel can take a full day. 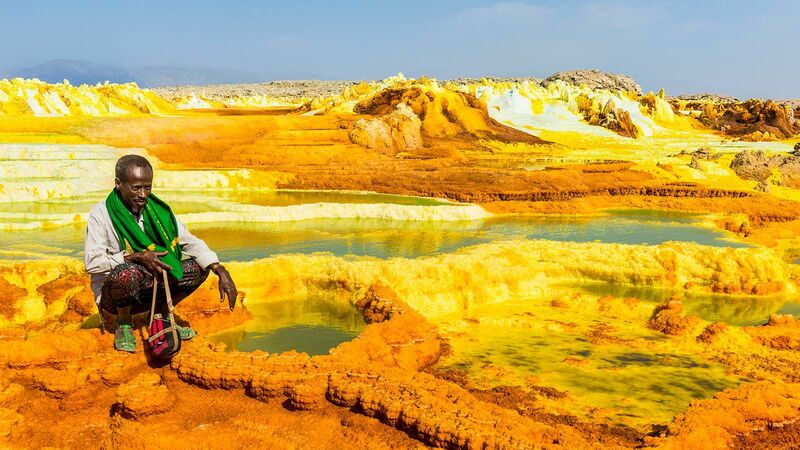 Just looking at photos of the Danakil Depression is making us thirsty.